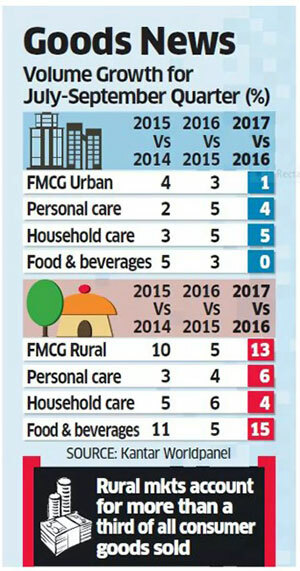 This is the second consecutive quarter of double-digit growth in the rural FMCG market, which helped to boost volumes in the overall fast-moving consumer goods sector by 7%. MUMBAI / KOLKATA: Purchases of consumer products and automobiles in rural India picked up pace during July-September, outstripping the rate in cities, as a good monsoon lifted farm income. Rural sales of FMCG products by both value and volume — the number of products sold — increased 13% during the quarter from a year earlier, according to Kantar Worldpanel, the consumer insights arm of WPP, the world’s biggest advertising company. It was the fastest pace of growth in over three years. In contrast, the urban market expanded 4% by value and 1% by volume during this period, the researcher said. 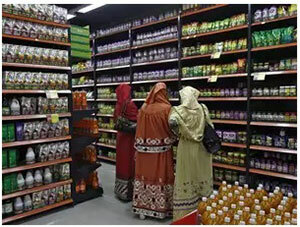 This is the second consecutive quarter of double-digit growth in the rural FMCG market, which helped to boost volumes in the overall fast-moving consumer goods sector by 7% compared with about 4% a year earlier. The rural market accounts for more than a third of all consumer goods sold. “In our case, rural growth has been very good. GST itself is creating demand. There are other factors also — the economy is doing well and overall, we are back to normal,” said Adi Godrej, chairman of the Godrej Group, which sells appliances, food and grocery and personal and home care products. “Companies have become proactive by increasing direct distribution in rural areas as the headroom for penetration is very high compared to urban, which is saturated,” said Abneesh Roy, senior V-P, institutional equities, Edelweiss Securities. Edelweiss Securities’ Abneesh Roy said direct benefit transfer (DBT) for job guarantee schemes and crop procurement, which eliminates pilferage, has put more money in the hands of rural customers. Urban consumption growth was constrained primarily by foods, while home care expanded by 5% and personal care by 4%, continuing their normal growth trajectory, said K Ramakrishnan, country head at Kantar Worldpanel. “The drop in growth of foods was driven by high-volume categories like atta and rice, which have shown a marginal decline,” Ramakrishnan said. Food accounts for almost 70% of the total volume sales, according to the researcher. Auto companies and manufacturers of refrigerators and washing machines said rural purchases have increased. Maruti Suzuki, which sells one in every two cars in the country, said rural sales grew faster than in urban areas at 22% so far this financial year, the highest in recent years. “Two consecutive good monsoons, strong minimum support price and increasing availability of finance has ensured higher off-take in the rural markets. Led by new models and expanding network, we expect to sustain the momentum,” said RS Kalsi, senior executive director of sales and marketing at Maruti.“Double-digit growth in rural areas has offered a cushion to slowing urban sales,” said Rakesh Srivastava, director of sales and marketing at Hyundai Motor India. While white goods and television sales went up by 12-13% in July-September, their growth in rural India during this period was 16-17%, as per industry data. Executives said sales growth in rural India exceeded that in urban areas for the past three quarters. “Low penetration level and good monsoon boosting farmer income has been the main reason behind this higher growth in rural India,” said LG India director-sales Rajeev Jain. Another reason the industry cited was the electrification drive in smaller markets, which is boosting demand. Over the past decade, sales of branded daily-need products in the nation of 1.3 billion people have increasingly relied on the vast rural hinterland, home to about 800 million people whose purchasing behaviour depends on farm output. Therefore, annual monsoon rains that help irrigate India’s crops play a vital role in shaping buying patterns in Asia’s thirdbiggest economy. Below-average monsoon rains over the past couple of years had been blamed for stagnant sales growth. Market sentiment is improving and stabilising after the introduction of GST, which consolidates multiple central and state taxes into one. 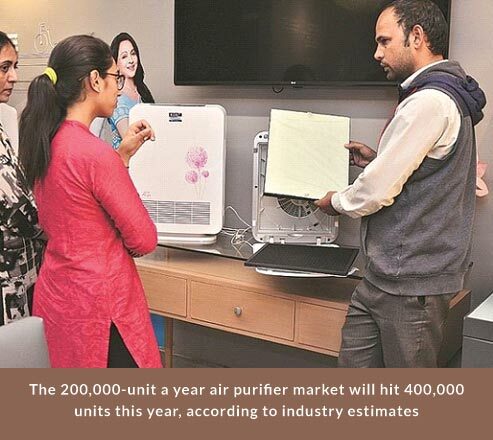 “We expect the demand scenario to move up, in both the rural and urban markets,” Malik said. According to some companies, several unorganised makers of unbranded consumer products such as detergents, oil and soaps sold in the rural areas were slow to register with the GST network or failed to comply with the new tax structure, helping bigger firms gain market share. Changes in pricing after GST also helped rural growth as rates fell for some products. “We believe that GST can be converted into a competitive advantage since we compete with a lot of unorganised players that are affected due to the new tax regime,” said Saugata Gupta, MD at Marico. “The company expects rural to contribute nearly 40% of sales in the next few years.” In the run-up to the introduction of GST, several consumer companies cleared inventory across trade channels, especially in the urban markets, amid uncertainty over pricing of goods produced before the start of the new tax regime. A few months ago, most companies said the pace of re-stocking was slower in the rural markets as wholesalers adapted to the transition. They expected the situation to stabilise by July-end. Hindustan Unilever, which posted a 10% rise in sales in the second quarter of the financial year, said that it was difficult to break up the growth on the basis of demand and inventory change. “For the market to move up significantly, rural growth will have to move up because that is where the headroom to grow is the maximum,” HUL MD Sanjiv Mehta said last month. Demonetisation of currency notes of Rs. 500 and 1,000 and their impact on the Indian economy, consumers and the government have been the most discussed subject in India since 8th of November. How has the reality compared with the apprehensions of severe impact on home textiles business? After the sales going down steeply by 70% in the first 10-12 days since demonetisation, it has started recovering. Today it is at 50% of the pre­ demonetisationlevel. Ratio of transaction has changed from 70% cash to 30% cash and balance by credit cards or a-payments. Profile of customers is also undergoing a change. More younger, professional and business community is buying now, while the sales from Government officials has declined. Demand for high priced products is giving way to middle priced products. I see it as along term trend. In my opinion, the impact will be in the short term. I foresee we closing this financial year (2016-17) sales going down by 25%, which will more than recover in the next financial year. The overall home textiles market will continue to grow in India, in fact, the growth may get further impetus, as people spend more confidently. However, the demand for expensive branded products will go down and middle and economy end products will increase in this new scenario. For some time, demand form high end architects and high end who will quickly switchover to e-payments in one form or the other. They are likely to invest more in adapting to better products and better lifestyle in the years ahead. Their numbers will only keep on increasing, and they in any case welcome a cleaner economic environment. Though the impact was high in the initial 1O days from the date of announcement of demonetisation, the recovery was equally quick. Today, after 40 days, we see a net impact of about 15-20% on our sales. This too should neutralize by the end of this financial year. I think in the long term nothing will be impacted except those indulging in clandestine import through havala or under invoicing. I feel that genuine importers or representatives of premium international brands will also not be impacted much, as the genuine consumers will start buying again within a month or two. For standard brands like ours there will be no long term impact as both retailers and consumers will return to buying sooner than later. Less Cash economy is here to stay. Therefore, buyers will be forced to change their paying habits to non-cash means. They cannot stop consuming. With Swayam experience, we see the impact of demonetisationon our business in two parts. Short term and long term. Short term is what we are experiencing and long term is what we are contemplating. Swayam as a brand has two roles to play. One as a manufacturer, where we have to take care of our people in production. Here, since most of our 350 workers have a bank account, we did not face much difficulty. But since many of them had to go and stand in queues for long hours to withdraw their monies, we could not refuse them and this brought down our productivity by 10-15%. Besides, we faced some problems in sourcing small quantity of accessories in cash, as it was difficult to route them through banking system, which we do for most of our large purchases. Second, as aretailer of our brand. Here, historically, post Diwali, sales always come down by about 15- 20%. This time it was down by 40%. Our experience was that our online sales also went down because many online retailers stopped cash on delivery. In fact, we did not see much impact in our sales through Large Format Stores, except for the first few days. I have been talking to several retailers across category. After first three weeks, December month now looks much better, and almost at par with our sales in last December. In fact, we may get amarginal improvement. Frankly, as I talk to you on 22nd December, the impact of demonetisation on our business has not been as bad as we were expecting. It doesn’t mean we have had no impact. But recovery was much faster than we expected. November was extremely bad with sales going down by almost 60-70%. But in December first week we witnessed recovery process. We were quite worried because historically, in furnishing business over 80% sales have been in cash. To our pleasant surprise, many customers switched to digital payments, which we were not expecting to happen so soon. I was personally expecting things to improve only from February. Situation has been better than that. Today, our sale is down by 15-20%, but we are on arecovery path. Initially, demonetisation certainly created an unpre­ cedented situation in home retail market. Retailers, specially the stand alone stores dealing with home decor & home textiles reported decline in sales upto 50-60%. Their repeat orders with us were virtually non-existent. Large Format Stores too have seen decline in sales, but their position was not that bad, and they are still paying us in time.